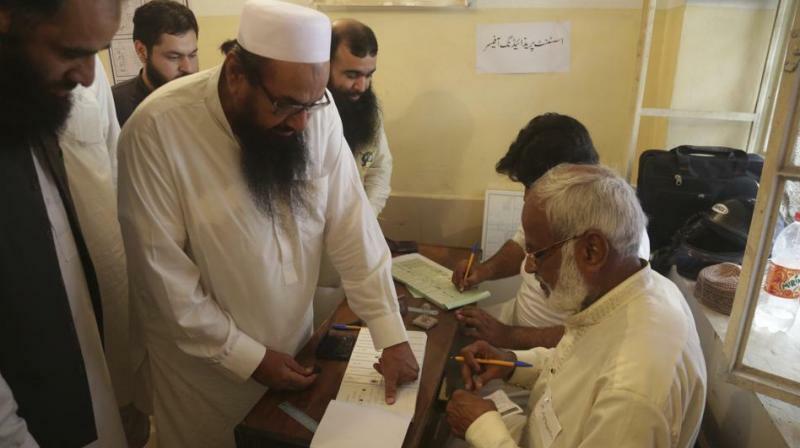 Islamabad: Extremist and banned groups, including Mumbai attack mastermind Hafiz Saeed-backed Allah-o-Akbar Tehreek, have been rejected outright by the Pakistani voters in the just-concluded general elections whose final results were announced on Saturday by the election commission. According to the Election Commission of Pakistan (ECP), not a single candidate of the Allah-o-Akbar Tehreek party, supported by the banned Jamaat-ud Dawa (JuD) chief, could win a seat. The ECP results show the party candidates got just 171,441 votes, just a drop in the ocean when compared with more than 100 million registered voters and more than 50 per cent turnout in the polls. Imran Khan’s Pakistan Tehreek-e-Insaf emerged as the single largest party in the general elections, winning 116 National Assembly seats out of the contested 270 parliamentary constituencies, the ECP said. The little-known Allah-o-Akbar Tehreek party name was adopted after the ECP rejected Saeed’s bid to register Mili Muslim League. Tehreek-i-Labaik Pakistan (TLP), another party with clear sectarian mindset, had fielded more than 150 candidate at the National Assembly seats and hundreds more on provincial assemblies. The party got 2,191,679 votes and just two of its candidates were elected for the Sindh provincial assembly, the ECP results showed. The TLP is representative of Sunni Brailvi sect, the largest in Pakistan, and also believes in Sufi Islam. The party lately exhibited signs of aggression when its supporters laid siege to the capital Islamabad last year. The party, however, has not been involved in any kind of terrorism in Pakistan or beyond its borders. The parties propagating moderate Islam had contested the polls from the platform of Muttahida Majlis-e-Aml Paistan (MMAP). They got 13 seats while getting 2,530,452 total votes. MMAP is the fifth biggest party in term of total votes, while TLP followed it at number six, according to the results. Jamiat Ulema-e-Islam Sami (JUI-S) got only 24,559 votes, it added. Rejection of JUI-S’ candidates is significant as its head is Maulana Samiul Haq, who is known as godfather of Taliban and his seminary is called as ‘University of Jihad’. There were other religious parties contesting the polls and they also fared poorly. While Tehreek-i-Laibak Islam got just 68,022 votes, Majlis-e-Wahdat-e-Muslimeen Pakistan of Shiites received 9,606 votes. Sunni Ittehad Council got 5,939, the ECP said. Pakistan faced a great deal of criticism both from the international and local media and human rights groups as well as political leaders for having hundreds of individuals with clear links to extremists openly campaigning in the election. The voters of Pakistan have rejected the candidates ties with extremist or banned groups and scuttled their move to join mainstream politics.